A process server is an individual who personally delivers a legal notice (known as a process) or other court documents to a party in a lawsuit (i.e. defendant). The process server is not a party to the suit. To become a process server, individuals need to apply for a license and obtain a process server surety bond as part of the licensing procedure. What is a Process Server Bond? A process server surety bond is normally a prerequisite to obtaining a process server license, which makes the process server bond a type of license bond. The bond guarantees that the process server will carry out their duties in compliance with the rules and regulations governing process servers in their city, county or state. It also guarantees that the server will deliver the process (court documents) to the individual (defendant, etc.) they've been assigned to serve papers to in a timely fashion. Process server bonds provide protection to the state, and to the parties that the process server is assisting. If a process server does not comply with state regulations for process servers, such as professional or administrative codes, a claim can be filed against the surety bond and compensation by the surety can be requested. Such non-compliance can take the form of mishandling of documents which have been entrusted to the process server, or partial execution of responsibilities based on an interest in the outcome of a certain court proceeding. When a legitimate claim is filed by an obligee against the bond, the surety steps in and compensates the obligee for any financial harms they have suffered. The principal, the process server, must then compensate the surety for its coverage and backing. Who needs to obtain a process server bond? Are there different types of process server bonds? Can I get a process server bond with bad credit? How do I get my process server bond? These bonds are only relevant to process servers. Furthermore, not all states require process servers to obtain a bond, though many do. Whether or not you need to obtain such a bond is determined by the relevant agency, department or by a court in your county or state. Typically, process servers will be asked to obtain a process server bond as they apply to obtain their process server license. Process server bonds typically have more or less the same scope of coverage, though there may be differences in local jurisdiction and state regulations as to what constitutes the role and responsibilities of process servers. For example, in California, the Business and Professional Code of the State of California specifies the obligations of process servers. In New York City, this is regulated by the Administrative Code and the Rules of the City of New York. Due to these differences, separate bonds must be obtained in each state, and apply only to the state they are obtained in. There are, however, different bonds depending on whether an individual or an agency is getting bonded. The cost of a process server bond is a fraction of the total amount of the bond. The total amount of the bond is determined on a state level and most states have bond amounts between $2,000 - $10,000. Applicants with strong personal credit will usually pay just 1% to 3% of the bond amount. If you are obtaining a process server agency bond, you may find that your bond amount, and hence your cost, is higher than for individuals. For example, NYC has a $100,000 Process Serving Agency Bond requirement while individual process server bonds in the city are in the amount of $10,000. Our Bad Credit Surety Bonds program allows applicants with a less-than-perfect credit to get bonded. Under this program, those with bad credit tend to pay a little higher, at rates ranging from 4% to 7.5%. We have access to a variety of markets, thanks to the highly professional surety bond companies we work with. All of them are A-rated and T-listed companies with excellent standing, which means that we are able to secure high quality bonds at low prices for our clients. Lance Surety Bonds prides itself in offering only the best and lowest rates to our clients, regardless of their credit standing. We are committed to helping everyone get their surety bond at the best price! To get your bond you just need to apply online and submit your surety bond application form. Since most such bonds do not require credit checks, processing times are minimal and approvals are fast. Should you have any doubts or additional questions, just call us at (877)-514-5146. Our surety bond experts will gladly respond to any questions you may have and provide you with help, if needed! 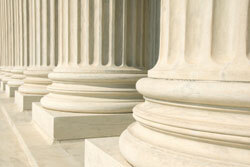 Process server licenses and bonds usually are valid between one and two years. When your renewal deadline approaches, you will need to submit a renewal application, as well as part of the above documents and renew your surety bond as well.